My local community newspaper, The Westsider, invited me to write a monthly column on mental health. I’m so rapt! How amazing and under-appreciated are caterpillars… These ground/plant-dwelling crawling things change almost completely into a flying insect that eats different things and lives a very different life. That is amazing. Astonishing for its biological audacity, really. 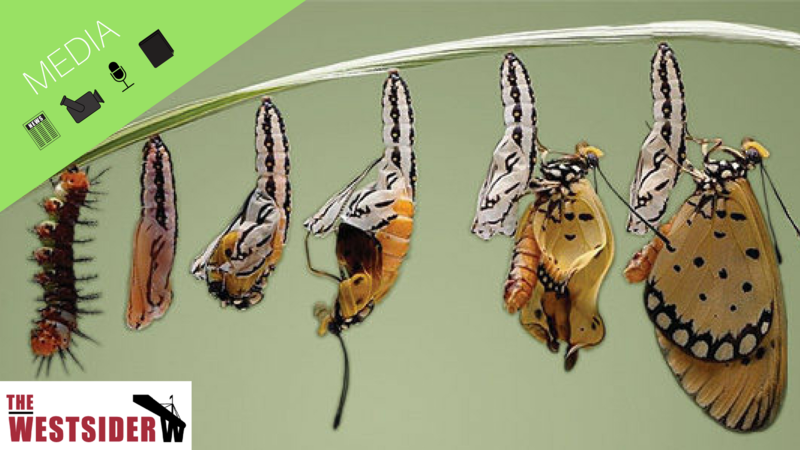 It blew my mind (no pun intended) that when changing from a caterpillar into a butterfly – two stages of one life which could not be more different to each other – not only do the limbs and body change, but the brain. So impressive! Maybe I could be like a caterpillar? Previously, the only comparison I’ve been permitted to draw between them and myself is when reading the classic The Very Hungry Caterpillar to my kids. Like that caterpillar, I’m prone to bursts of overconsumption followed by periods of lethargy. But I don’t emerge a beautiful butterfly; rather just a regret-coated, “never again” declaring, cuddly guy. Ha! In recent years my life has changed dramatically. My marriage ended, I had a breakdown, and I’ve taken an extended break from the promising career trajectory I was zooming along. To stretch the analogy, I was living as one being, and I thought I was content with that. On paper, I had everything I’d assumed I ought to dream of: a life partner, three healthy and happy kids, a well-paid job with great prospects if I kept working hard, a house in the ‘burbs, and plans to start looking for a caravan or even better, a holiday house. But in reality, I was one of the many, many people in our part of Melbourne seriously battling with my mental health. And while I was doing the ‘right’ things of taking medication and seeing a psychologist, I hadn’t changed the things that exacerbated the chemical imbalance, at all. And I was losing the fight between the façade I’d been showing the world, compared to how I really was. And then everything fell apart. My former spouse and I decided to separate. I moved out of the family home in the burbs. I had to take extended leave from my well-paid job. And I had to stop kidding myself that ‘getting better’ was something that’d just happen with time. You see, I wasn’t just bitten by the black dog, it mauled me. Nearly tore me limb from limb. Nearly. But like the sappy memes on Instagram say, it wasn’t until I fell apart completely that I saw this period for the opportunity it really was. I was encouraged and allowed to evaluate EVERYTHING in my life. Every area, from my relationships, friendships, work, ambitions, lifestyle, values. The lot. And I discovered I am so incredibly resilient. More than I thought, to be honest. In falling apart, and giving myself the permission, space and time to do it properly (yes, there is a right way to do it, which is completely and without resistance), I saw the mostly-blank canvas before me. It was full of possibility and I could paint whatever picture I had in mind. Like the caterpillar that evolves into a butterfly, my spirit and essence has changed, and is still changing, into something very different. I don’t actually know all the attributes of what I will end up being, but the resilience I’ve discovered, and the self-trust and belief I’m building, are all I really need. If I emerge as a butterfly or a moth… I don’t know. And frankly, I don’t care. Knowing I can evolve and change is the real prize. Originally published at The Westsider.